There are two interesting pieces of news on the global temperature evolution. First, today a paper by Grant Foster and Stefan Rahmstorf was published by Environmental Research Letters, providing a new analysis of the five available global (land+ocean) temperature time series. Foster and Rahmstorf tease out and remove the short-term variability due to ENSO, solar cycles and volcanic eruptions and find that after this adjustment all five time series match much more closely than before (see graph). That’s because the variability differs between the series, for example El Niño events show up about twice as strongly in the satellite data as compared to the surface temperatures. 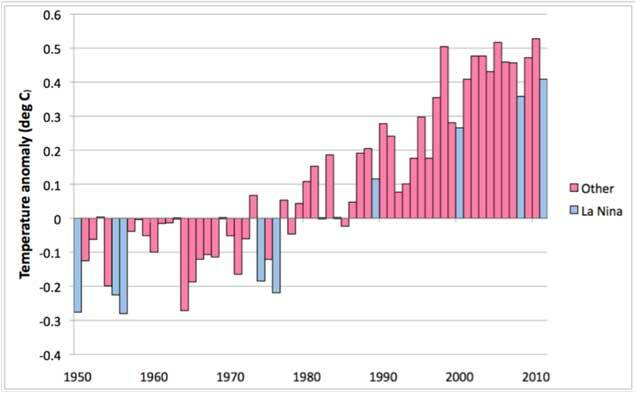 In all five adjusted series, 2009 and 2010 are the two warmest years on record. For details have a look over at Tamino’s Open Mind. They find – pretty much in line with the Foster and Rahmstorf analysis – that La Niña conditions have made 2011 a relatively cool year – relatively, because they predict it will still rank amongst the 10 hottest years on record. They further predict it will be the warmest La Niña year on record (those are the blue years in the bar graph above). I don’t think the study says anything about long-term cycles. The reference period is only ~30 years so any longer term effects will simply be part of the apparent trend. There was a large volcanic episode in early-1982 followed by an extreme El Nino in 1983 (comparable to 1998). I imagine these large overlapping competing factors, at that point and elsewhere, played havoc with calibration of the model which leaves the adjustments being useful but less than perfect. Depends on what you mean by “long-term” here. Have you heard of Milankovitch Cycles? @10 – No global LIA? Surely you jest? Pretty much, for a 30 year period. There may be some cycles on decades or century timescales, but with low amplitude (i.e. significant impact). Longer term cycles would be too slowly changing over 30 years. are very happy to use the graphical appearance of their analyis to suggest significant new record temperatures. You’re pointing out that analyses of different things show different things? OK, then. That wouldn’t seem to justify your insinuation that there’s something untoward about the Foster and Rahmstorf analysis. It’s almost as if you don’t have anything of substance to say. PKT, short time spans don’t allow detection of a trend. You don’t like the picture. That doesn’t mean the authors are trying to fool you with it. You don’t like seeing the pointy bit on the right higher than the flattish bits on the left. OK, we get that. You think the whole line looks too steep. You found a less steep one in Zeke’s article — OK, we get it. But you’re fooling yourself focusing on the appearance of the picture while ignoring the data behind the chart. You can’t understand climate just looking at pictures of charts. Yes, people can be fooled by them. We know that. But — you can’t force all the charts to use the same scale or time span. They’re _pictures_ of data. Take any climate science question. Test it for yourself. Put it into Google, then into Scholar, then into Google Images. Google gets you a dog’s breakfast of information. Scholar gets you mostly science, with a smattering of, er, other stuff. Image search gets you — invariably — mostly denial/PR blogs. The pictures impress people who don’t understand the arithmetic. OK. That’s your point, we get that. But you can’t fix the _pictures_. People who point to pictures _without_ explaining them can’t be trusted. Don’t assume you know the motivations of the authors. Read the text. Read the captions. You’re arguing against a picture because you don’t like the picture. Instead, try to understand it. I’m writing today as less of a comment and more of a call for help. I have a very strong science background (mostly in the biological sciences) but I have to admit I’m very much lacking knowledge in climate science. So much so that I don’t even feel comfortable commenting on it. I’ll turn myself over to you experts. Can you all recommend any good sites where I can learn the truth from the ground up? I have a science based website and I’m sure the topic will come up some day. As I said at Tamino’s blog, I have done a very similar analysis (but far less sophisticated) to that in Foster/Rahmstorf using nothing but Excel and manually tuning the magnitude and lag of the ENSO, AOD, and solar forcings. It’s quite easy to do, and while it isn’t worthy of publication by any means, anyone with Excel and a small amount of statistical knowledge can verify Foster & Rahmstorf’s basic conclusions for themselves. In fact, the more I think about it, the more I think that doing the basic analysis is so easy that it ought to be required of anyone who wants to be taken seriously in a discussion of climate in which math, data, and science are involved. I don’t know how anyone could comes away from their own analysis still thinking “it’s all natural variability” or anything similar. And these days, nearly everyone’s got Excel or something similar. Guy McCardle @57 — There is the start here at the top of the page. That will, in part, direct you to “The Discovery of Global Warming” by Spencer Weart which is also linked (first) in the science section of the sidebar. In addition to the sage advice from David B. Benson above, I also suggest that interested people go to Skeptical Science for over 4,700 different threads discussing the various nuts&bolts (and controversies) of climate science. There is an immense amount of reference material discussed there and it can be a bit difficult at first to find an answer to your questions. That’s why it’s recommended to peruse the Newcomers, Start Here thread first followed by The Big Picture thread. I also recommend watching this video on why CO2 is the biggest climate control knob in Earth’s history. Remember to frame your questions in compliance with the Comments Policy and lastly, to use the Preview function below the comment box to ensure that any html tags you’re using work properly. Depends on what you want to learn. If you’re looking for general assessments of climate change, the IPCC 2007 report is probably the most comprehensive single source, and while there’s been good progress since then on a number of topics, not thehing in “big picture” has really changed. The National Academies also has several online reports on the subject, as does USCCP, depending on your interests (the recent 2010 Climate Stabilization report is a great read). For a more general climate physics background, textbooks are probably the only good route. “Global Warming: The Complete Briefing” by Houghton, as well as David Archer’s “Understanding the Forecast” are great as a qualitative (or some algebra at the most) based introduction that covers many of the big topics needed to start discussing the issue. These might actually be something good to read before the IPCC report. For more climate physics, Dennis Hartmann’s is good, less based on climate change than climate dynamics in general, and a bit more mathematically rigorous. Ray Pierrehumbert’s is one of the more thorough, although might have a lot of information you’re not interested in, and while it gives you all the tools to think about climate change, is not a “climate change” book per se. Guy McCardle @ 57, by all means start with Spencer Weart as recommended. You can order the book right now. It doesn’t cost much. I think all the contents are also online but it is best to read an actual book offline for some longer things (not too long in this case). On grasping that our environment is much warmer than the bare rock approximation you will not be mystified that global warming occurs…. After a planet’s basic heat balance, planetary physics is also about all the consequences of the constant energy flux through the environment. Then there is paleoclimatology and more. Thanks for linking those, Pete. Perhaps you could articulate a coherent reason for thinking that. Guy McCardle, if you are still “here”, I’m going to partly disagree with Chris Colose. This would generally be considered absurd since he is way ahead of me in climatology, but of course you will know what works for you. If you start with Skeptical Science (which is greatly appreciated by the reality oriented community) what you find is one argument after another after another with no end in sight. On the other hand if you start with fundamental science then the argument over the big picture ended some time in the past. Chris probably agrees and was too modest to mention this. Skeptical Science example: in one of their recent posts they counter someone who has a convoluted argument that sea level is not rising. Well, is it or isn’t it? First, as a known physical fact it is. Second, there are basic physical reasons like conservation of matter that make it rise. 1) thermal expansion of the oceans: measured ocean heat content keeps increasing and this causes the ocean to expand. 2) loss of land based ice: both land based observations (Glacier National Park for instance) and satellite gravity measurements make it clear that land based ice is decreasing. So where is the water? Is it in the air? In a warmer world there is more evaporation (and precipitation) and more water is in the air. I have seen this estimated as about the volume of Lake Superior so far. This is no match for 1 and 2 above. Is it in the earth? In fact when there is a year of heavy flooding, drainage can’t keep up and sea level drops, but this variation is superimposed on the long term trend of rising seas. Over long time periods the amount of water within the earth’s crust can vary, but we are depleting aquifers (partly countered by building reservoirs). So by conservation of water, sea level must be rising. Of course scientists check and check and compare measurements against each other. But they don’t really suspect water is vanishing from the planet and neither should you. In short: I suggest getting a handle on the physical basics, and linking people to sites like Skeptical Science if they insist on arguing. At least initially, and permanently for most people, all the details at Skeptical Science (eg of individual arguments against physical realities) are a distraction. It is nevertheless very valuable to have a site like Skeptical Science on hand. Looking at the bottom graph, or perhaps in general. Shouldn’t one say “in a time-scale DOMINATED by non-La Nina episodes, La Nina seems to not be very influential”? Although I like how you frame this otherwise from your point of view, I think the above statement would be more correct, no? I’ll weigh in on this a bit. You asked specifically for “sites” – I presuming that you want something you can read on the web. I strongly suggest that you consider other sources, particularly in the form of textbooks for undergraduate (or perhaps graduate) university courses. What university or college libraries are close at hand? Or a university bookstore? Nearly any introductory physical geography text will have a decent section on descriptive climatology, and this will be a starting point for the basics. (The only exception I can think of offhand would be the one that has Tim Ball as a co-author.) If you can’t sign the books out, one of these would probably make an easy afternoon’s quick read in the library, based on your description of your science background. Don’t expect there to be much math – but that will make it easy to get your head around the basic concepts. When I was an undergrad, we used Sellers “Physical Climatology”. That’s clearly dated now (printed in the 1960s), but is a classic. Covers earth-sun relationships, radiation and energy balances, microclimatology, and includes some math. Shows up for $7.98 (used) on Amazon. I’ve also heard that Hidore’s book is not too bad, but I have no direct experience with it. It’s the first hit in Amazon’s “climatology” search. Once you get going with some basics, you can focus in on which part of the subject you want to learn more about. At that point, come back here with a description of what you have learned and what you want to learn, and get more suggestions. If you start with something too specific or advanced, you’ll find that sources may assume more than you already know. The picture at the top — used to illustrate the original post — is a composite, without spaces between the pieces, and if you just look at the picture without finding the description, you’ll boggle when you read the numbers along the Y axis. It’s a composite of four different charts — with overlapping temperature span — but the four are stacked so it looks like one big X/Y chart. All the originals are available where that comes from. Any chance someone with a connection to the work could do a graphic illustration that works for this? Pick pictures and write simple captions to explain what’s being published? Thanks so much to everyone who gave me advice on how to get educated about climate science. I know I said sites, but I’ll be reading good old fashioned books as well. Someone asked what colleges/universities I live near. Fortunately I live fairly close to Penn State University. They have a good meteorology program. I even used to read forcasts for Accu-Weather in State College a long time ago….but I digress. I’m ready to dig in and learn. You guys have all been nice and very helpful. Thanks again. Pinatubo erupted in 1991. Did you mean El Chichón, which erupted in 1982? I think this is neat, that is Foster and Rahmstorf. Does anyone know what causes the few large fluctuations that remain, e.g. 1982, 1983, 1984? I’m guessing “no” or else it would have been removed. Is there an implicit or explicit claim that this linear trend (plus identifiable disturbances) will continue into the future? Can you decompose this into a part due to CO2 and a part due to whatever produced the rest of the increase since the 19th century? 51, Paul S: There was a large volcanic episode in early-1982 followed by an extreme El Nino in 1983 (comparable to 1998). I imagine these large overlapping competing factors, at that point and elsewhere, played havoc with calibration of the model which leaves the adjustments being useful but less than perfect. Foster and Rahmstorf (Figure 7) display the estimates of the effects of the MEI, AOD and TSI, but not the MEI, AOD, and TSI themselves, so you can’t determine from their paper whether a misfit to one or more of them is responsible for the swings that remain. I don’t mean that as a criticism: I like what they did. What field did say you’re in? How do they publish databases in your field? On page 2 you’ll find “Section 2. Data” listing how to get what you’re not-complaining about not-having. Tamino also tested an index based on pressure, but it didn’t change the results. Here’s a graph with all three components. There is a disparity between the El Nino index and smoothed temperature after large eruptions, as it should. The principal author said that there should be residual effects remaining, since the correction factor is a single value, applied across the entire data set. Hence extremes–such as the 1998 El Nino, for example–will be under-corrected. The phrasing is mine, so any errors are not the fault of said author. . .
That was really only a minor comment about Figure 7 and the relevance to guesses above about the remaining swings in figure 5 reproduced above. I didn’t say the data were unavailable, only that the answer to the question (was it the El Chichon eruption in 1982?) isn’t in the paper. respect to the entire time span, by adjusting the annual cycle to match its average over that period. Therefore the multiple regression includes a linear time trend, MEI, AOD, TSI and a second-order Fourier series with period 1 yr.
effect on global temperature. Therefore for each of the three factors we tested all lag values from 0 to 24 months, then selected the lag values which gave the best fit to the data. I don’t know why that goes in and out of italics. So, what do you think about the possibility that the El Chichon eruption was responsible for the residual big swing in 1982, 1983, 1984? Nothing? 1980-1984? Doesn’t matter what I think, let’s look for some science. Well, where would you look? Are global cloud albedo and climate controlled by marine phytoplankton? 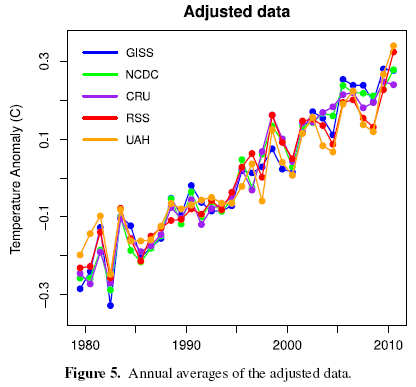 I like the way this reverses the rather bizarre logic of McLean et al 2009 who subtracted the linear trend then said, hey, presto, there’s only ENSO left. At least this is a real result, and one that includes some clear graphs that aid the nontechnical audience. Over here in COP-out-17 land, I’ve used this in what I hope is a clear presentation to the uninitiated. Comments and corrections there welcome. One good leverage multiplier to have in ones logical toolkit when confronting deniers, is the very fact that those of us who had at least some education in geophysics of oceanography back in the 1970s’, all learned – and correctly so! – that the Earth was headed into another Great Ice Age! This may sound like giving support to the denialist brou-haa-haa, but it actually drives home the Fact that the Full Impact of Human Climate Modification is actually staving off that very Ice Age – providing, of course, that we don’t turn off the Atlantic Conveyor……..I hear there’s some nice towns in Uruguay where the people speak Norwegian…..
Congratulations on a fine research paper. I think its very important to try to reconcile and unify the models to get as much agreement as possible. Even though the adjustments may no turn out exactly right, it puts a stake in the ground to explain at least one way agreement could be reached. 84, Hank Roberts, you are correct: we should look at all omitted covariates; the paper only shows that the temperature series discrepancies can be reconciled, not that this is the correct or best way to do it. The authors used lagged versions of the regressor variables in their analysis, so in principal we should not ignore the possibility that the 1982-1983-1984 inflection was driven by an event that occurred in 1980. It’s still a good paper. Very stark reading indeed. What I find very singificant is the CO2 concentration rate leading up to the last interglacial period. By using ice core analysis and other means we are certain that in the lead up 130KY ago CO2 was increasing at an average of 0.0001ppm/y. Wait for it!…we are currently pushing the rate at 2.0000ppm/y a 20000 fold increase. This rate must surely set a paleoclimatic record. We are definately in uncharted waters as even Prof. James Hansen would attest to. The big difference between the last intergalcial period and now is that now the air/ocean temp is rising year round forced inextricably by the relentless pressure of CO2. 130000 years ago it was the change in juxtaposition between the earth and the sun that caused the polar regions to heat up (still only by 0.7C warmer that today)and then that caused CO2 to increase. The situation now is the reverse of what is was then. We are literally in greenhouse conditions now and this is causing a 24/7/365 positive feedback juggernaut. In the last I.G.P flora and fauna at least has a fighting chance to adapt and evolve..not this time. A 20000 times faster onset now is a stupendously massive shock to the earth’s climate and it’s ecology. Personally I’m not sure how useful any future predictions of global climate based on the last IGP can be simply due to the unprecedented speed of today’s onset. Do known and well documented physical processes still operate and behave as they are supposed to under today’s rate of change? Perhaps I missed it while reading the paper, or I am simply to dense to have understood, but how did the authors weight the different forcings in order to adjust the data? To put things in my own elementary banter: When the TSI, aerosols or ESNO effect increased, the temperature values in the raw data sets were decreased, in order to modulate correct for the bias caused from that particular forcing, correct?.. Were the data sets treated on an individualistic basis, as the algorithms used to correct the initial raw data were different? Does this result suggest, since in the paper for the last decade stratospheric aerosols are low/flat, and since TSI is relatively flat and has small effect, that the recent fluctuation of global temperatures is mostly ENSO related? Thanks, I guess from all that people talk about the last decade I thought it would have been something more dramatic! Tamino’s answer was he didn’t know but the question should be put to ‘genuine’ climate scientists. (As if his own contributions are mere adjunct to the work of others!). So, to the genuine climate scientists, looking at the peer-reviewed paper that resulted, is there an answer to that question? Is there an estimate of total variability which is attributed to the parameters, how much is likely other causes, and how much is likely error? And I kid you not, Captcha says “Richard otedxt”. I’ve never otedxted before.